Simply exquisite. You'll fall head over heels for the graceful design of this romantic bracelet. The perfect way to complement your wrist. 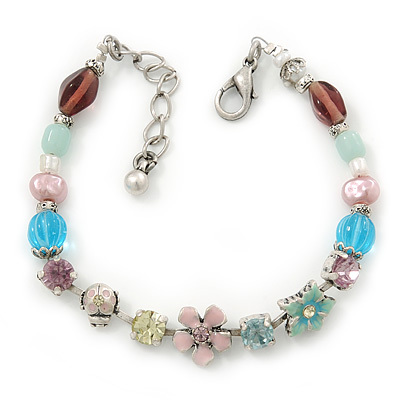 The bracelet made of various glass beads, freshwater pearls, Austrian crystals and enamel flowers in shades of pink, light blue and white. It measures about 16cm in length and and has a 4cm silver tone extension. Fastens with a lobster claw clasp.